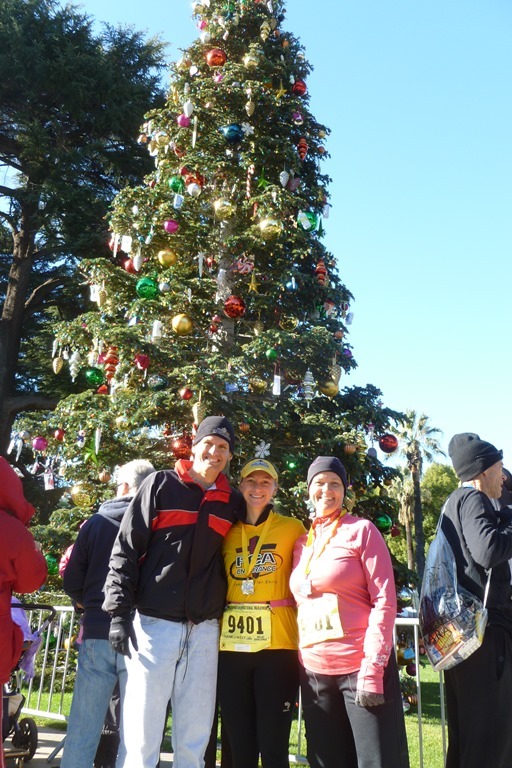 The California International Marathon Relay finishes the year off for us. 9% of the 12,000 race entrants are Relay runners. 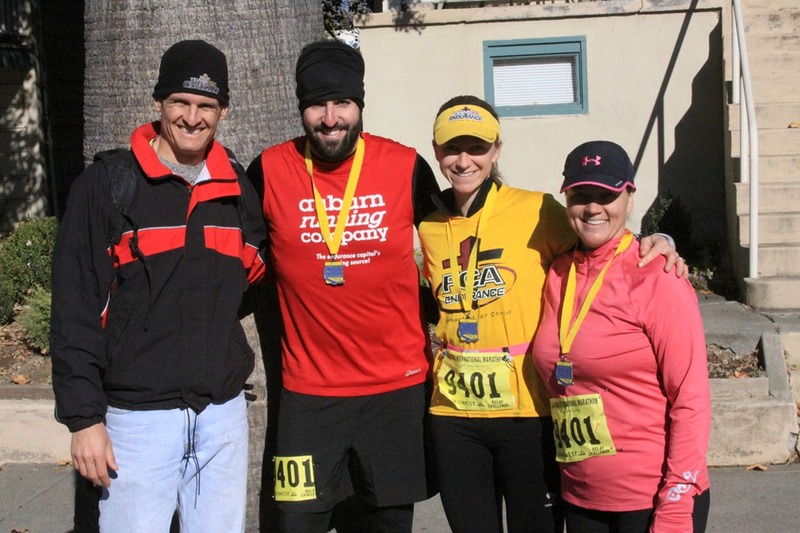 It's always a great time, and far from a simple 10k race. The team spirit, competition and logistics makes it exciting and brings out the best in everyone. I charted out all the meeting points, addresses, running paces and times. It's a lot of fun. The big factor this morning will be the cold! Below 30F. Robin is running in her UC Davis affiliated team as she has done for 15 years. I'm waiting at the 1st relay exchange. The hand-cycles go by fast. Then the leading men's group. It's freezing temps and some don't even have shirts on! Then the lead women's pack. Again, some are wearing the minimal 2 piece suits they would wear at a warm race as well. I guess you generate a lot of heat at 5:30 pace. Then the first Relay team comes through very close to the lead women. Troy Outman is with me, taking pictures, and helping me spot Tamara. Troy was our original runner before he sadly got injured and was replaced by Jesse. But Troy is still out here in the cold supporting his team. It's hard to see the runners over the crowd of Relay runners waiting. I don't even know what Tamara looks like, just that she's wearing bright pink. Liesbeth from Robin’s team comes in and Kevin, her husband, takes off. Soon I'm wondering if I did the math wrong, but then there she is! Turned out the start was impacted so it took longer to cross the line. She has a great big smile coming in. We greet, exchange, and I'm off! Wow, always pumped this first mile. Runners everywhere and many to pass if I'm going to get us back on 3:15 pace. I'd really like to catch Kevin and run with him and have someone to talk to. Mile 1: 6:39. My goal is 6:30 pace. Right now it doesn't feel like I can get that, but anything can happen and I know sometimes I get faster as I go, like last month's Turkey Trot. Thanks to the Lord, I learned a lot from that race. I ran 6:20 pace and learned to pull through with my right leg more to ease the left hamstring soreness. It really boosts my confidence for today. I catch the 3:40 group. Mile 2: 6:42. Soon I'm comfortable except for my hands which are freezing despite gloves. I pass the 3:35 group. I skip the 1st couple aid stations. Later I learned that runners were falling from the ice built up at the earlier aid stations. Mile 3: 6:34. I'm getting faster. I'm remembering to look to the Lord. To be joyous despite the strenuous work. I'm trying to encourage others, too. I just catch the 3:30 group. Mile 4: 6:24. Wow! Terrific. I finally get water on a slight incline, going through a town with a HS band playing. Sounds great! But that brass looks cold. I'm careful not to get water on my gloves. It's still freezing out here. Mile 5: 6:18. I don't know how I did that but it has brought my overall pace to 6:31. And I caught the 3:25 group. Whoo hoo! Mile 6: 6:30. Ok, I'm not feeling worse.. I can keep this up. I'm plenty warm up top. A thermal long sleeve was almost too much. Mile 7: 6:21. I caught the 3:20 group and hoping to catch 3:15 before the end of my leg but it's going to be hard. I never did see Kevin. The last 1/2 mile is so long! I'm tired but so excited that I'm going to meet my goal! It's a great feeling. Now, for another good exchange. Mile 7.5: 6:25 pace. There's Jesse, just as planned. I finish in 6:30 pace, putting us just behind the 3:15 group. A good exchange. I tell him, "God is with you!" and he's off. Whew! Exciting. I see Robin with the girls and tell her that her teammate, Kevin, was ahead of me at the start so should be here soon. Didn't realize I passed him. Jesse caught and passed the 3:15 group, which was a good set-up for Desiree. We all made it to the finish to watch her finish strong. We also saw other Auburn runners and Tuesday Night Track runners finish strong! 3:21. 3rd place! (49th overal relays) Didn't have any transition mishaps. Although our 3rd runner, Jesse, lost the keys to Desiree's car, we prayed for the situation and amazingly he bumped into the person that found them. So everything worked out again. Thanks, God! We plan to do it again next year, and, who knows, one of these times we may even get 1st!